Ski helmets have become more and more popular over recent years, to the point that it is now more normal to wear a helmet than not to. 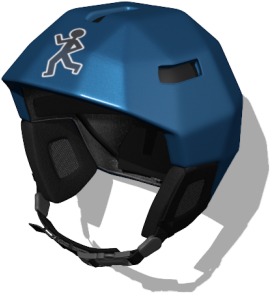 Modern ski helmets are now so functional there is almost no excuse not to wear one. The primary reason to wear a helmet is to protect your head, but that is far from the only job that a helmet needs to do. Modern helmets are full of features to make sure they fit properly, are comfortable, hold your goggles, and even keep you warm or cool you down, and with the vast selection of makes and models now available, there is a helmet to suit everyone. All helmets are CE1077, Snell RS-98 or ASTM F 2040 certified, ensuring that they will provide good protection for your head. These days most hire shops also hire out helmets, making helmets always available for use even if you are not in a situation to buy one, or don't have yours with you. Before you think of getting your own helmet though it is always good to know what the parts and features of a helmet do, so that you have a better idea of what you are looking for. Here the parts and possible features of ski helmets are listed, with details on what they do and how they can vary. The shell and core of a helmet are the parts of the helmet who's primary function is to protect you. The shell is generally made from polycarbonate plastic, and the core from expanded polystyrene, although shells can also be made from fibre glass and carbon fibre. 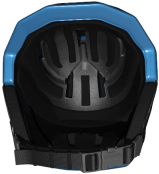 Both the polycarbonate and polystyrene plastics are light weight and good at absorbing impacts, making ski helmets light and comfortable to wear. The shell helps spread out the force of an impact and protects you from sharper objects, as well as protecting the core from day to day abrasions and scratches. The core is the part of the helmet that absorbs the energy of an impact, which it does through compression or destruction. Helmets should generally be replaced after a hard impact, this is because the polystyrene will not return to its initial state after absorbing a heavy impact, and will not protect you as well in the case of another impact. Many modern ski helmets have air vents, and for many people they can be a very important feature of a helmet. On most helmets the air vents can be opened to cool you down, or left closed to make the helmet warmer. 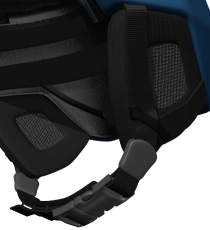 This is normally done by a slider button somewhere on the shell of the helmet, although some helmets have inner liners that plug the vent holes which have to be removed to open the vents. The number of vents and the amount of air that can flow through a helmet can vary a lot between models and brands. 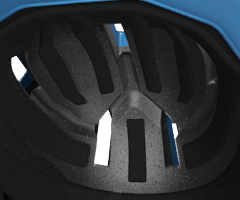 Some helmets only make vents a small feature, whereas others can have vents all over them to let as much air in as possible. 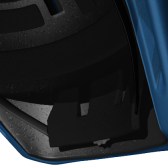 The air vents on most helmets also have channels on the inside of the helmet to let air travel through from front vents and leave through rear vents. 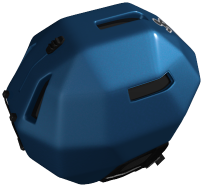 This enables more air to pass through the helmet, keeping your head cooler. On most helmets the ear pads are made of fabric and are seperate to the shell and core, like on the Mechanics of Sport helmet here. However on some helmets the ear pads are built into the shell. As well as protecting your ears, the ear pads need to keep your ears warm, while having a minimal effect on your hearing. On most helmets with fabric ear pads the ear pads are also removable, so that they can be washed, and also so that the helmet can be worn without the ear pads, which can make a helmet a lot cooler. 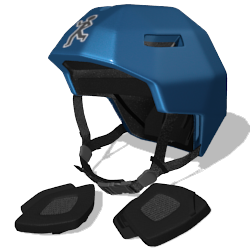 The ear pads can also be a high tech part of a helmet as some helmets come with ear pads that contain speakers or can have speakers added to them, enabling you to listen to music while on the chair lift, or even answer the phone via bluetooth. All ski helmets have a strap that goes under the chin to both hold the helmet firmly on your head, and to make sure the helmet stays on your head in the case of a crash. 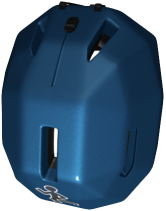 The straps can be adjusted to the right length so that the helmet is comfortable, and the 2 ends are locked together by a buckle. There are a few different types of buckle that can be found on ski helmets, the most common being the clip buckle as on the Mechanics of Sport helmet here, and a ratchet buckle where a laddered length of plastic, slots into a hole with a spring clip. Both types of buckle work well and efficiently, although the ratchet buckly can be made a bit tighter or looser without adjusting the strap length. Most straps also have a chin pad on them to make the strap more comfortable lying against your face. On most helmets the goggles go around the outside of the helmet, and can be secured to the helmet with a goggle mount on the back. There are a few different types of goggle mount that can be found on helmets, there is the elasticated cord with a hook and pull as on the Mechanics of Sport helmet, but you can also have a strap with a popper, and even a shaped bit of plastic that makes it hard for the goggles to come off. There are a few helmets which are designed for goggles to go inside them, and have a channel inside to make room for the strap, although this is not so common. The lining is the padding inside a helmet that makes it more comfortable, giving you a soft layer between your head and the helmet core. The linings on most helmets are easily removed and replaced so that they can be washed, and some helmets even come with a couple of sets of liners of different thicknesses so that you can customise the helmet to be the most comfortable for you. A lot of helmets have an adjustable band around the back of the head, which can be lengthened or shortened to make sure the helmet grips your head firmly and does not move around. The mechanisms for the adjustment differ between manufacturers and models, some have an adjustment wheel like the Mechanics of Sport helmet, whereas others can have systems with ratchets and buttons, or even have an air bag that can be inflated to grip the back of your head. 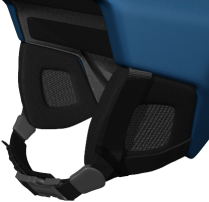 Often the height of the adjustment band can also be adjusted by changing where top of the padding clips into the helmet's core. When deciding on a helmet there are several things you will want to take into account, including cost, function and style. 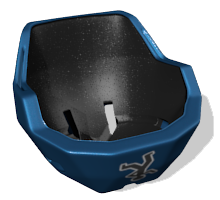 As with almost anything, the helmets that most people consider as more feature packed, better made or better looking, tend to be the more expensive helmets. When looking to buy a helmet, it is always worth checking out a few different makes and models, to see how they differ. Generally one of the first things to do when looking for a helmet is consider how much you want to spend. If you are struggling for money a bit, and only expect to go skiing for one week each year, you are probably not going to want to spend too much on a helmet. However if you ski often and in all sorts of conditions, or money is not so much of an object, you might well be looking at something higher up the price range. Then you need to consider function and decide what the helmet needs to do, all helmets have to meet certain safety standards, but if you are a racer or need a helmet that protects you more than normal for some reason, you might want to get a full face helmet, or one with a chin guard. Then there is comfort, and comfort can entail many things, not only how comfortably it sits on your head, but how warm the helmet will keep you, or how much it will cool you down if you open the air vents. There are also less common features such as ear pads with speakers in them, and bluetooth systems that connect to mobile phones. Of course for some people, looking good is the most important function for a helmet, and that's when we can consider style. For most people style won't be the most important feature for a helmet, but simple fact is that some helmets suit some people better than others, and most people would like a helmet to look good on them if possible. This means it is always worth trying on a few different helmets from different manufacturers, to see which suits you best while keeping to any other criteria. Obviously, there are always some people at the far end of the scale, where the most important thing for the helmet to do is to look good, and make some kind of statement about them. This is personal preference though, and if someone wants a helmet to make them be noticed, through bright colours and outlandish designs, or elegant materials and diamond incrusting, that is their choice. On to the Clothing section.